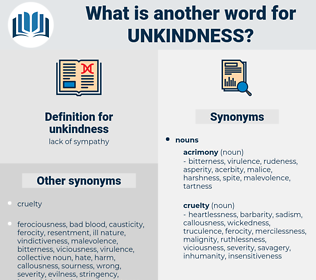 What is another word for unkindness? 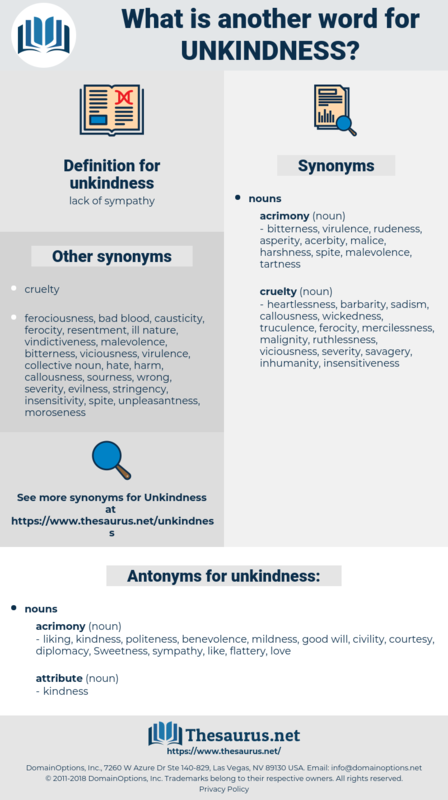 liking, kindness, politeness, benevolence, mildness, good will, civility, courtesy, diplomacy, Sweetness, sympathy, like, flattery, love. mercy, feeling, thoughtfulness, charity, gentility, consideration, niceness, compassion. generosity, virtue, morality, nobility, worthiness, goodness, honor. good manners, manners, humility, fear, caution, shyness, modesty, carefulness, timidity, respect, meekness. gentleness, amiability, good nature, smoothness. I pass over the injustice and unkindness on your part of that remark, and I hope you will accept my offer. How can I ever forgive myself for my unkindness to you, who were so good and generous to me, and mine, and never even reproached me for my cruelty?